Looking on Google earth I see that the rinway at Stretton appear to be in reasonable condition, is it used by a flying club or microlights ? In the 60/70's it was used by Ford's for testing. I don't know what goes on there now. Probably nothing. 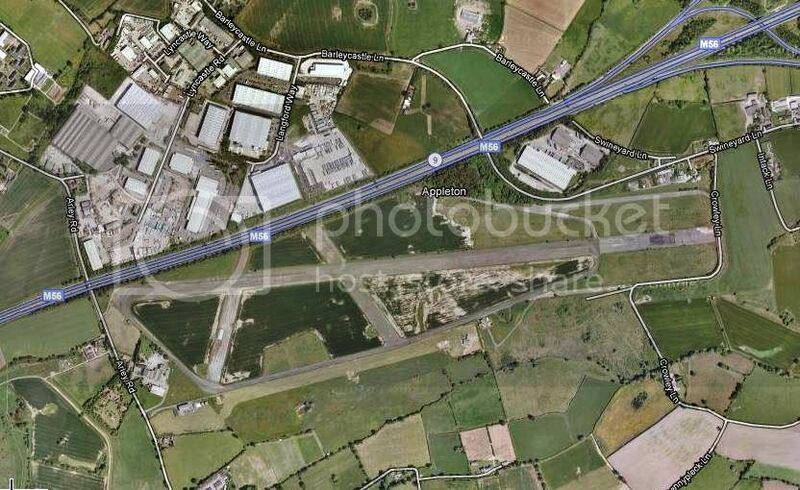 There was talk about opening it up and moving from Barton airfield to there but there were objections from folk in Appleton plus as you can see on the aerial photo the end of the runway is very close to the M56 motorway. I have seen light aircraft taking of in that direction but I'm pretty sure it's not from there, perhaps a farmer has a grass landing strip close by?. A few years back I believe Shell Motorsport Technology Dept.were using it as a testing circuit for their racing motor oils. Wasn't there something on the news pages last week about a private airstrip in the area - or was that at Rixton? There is a private airstrip at Lymm somewhere I think. The one at Rixton is on the farmland just by the Woolston junction of the M6 and is a grass strip. There’s the most stupid argument going on at the moment, not to limit the number of take off and landings (that's already been agreed at 500 in any one year). Now it’s something like only landing a maximum of 6.5 times in any one day of any four days a given week except Tuesdays and providing there's not a R in the month. Who the hell dreams up these rules and who's going to pay for the policing? How can you land a plane 0.5 of a time? I wondered that but if the limit is the total number of takeoffs and landings then there’s bound to be times when a plane lands one day and takes off another day. What I’d really like to know though is have we got someone on the planning departments who’s an expert on working this stuff out or are they just making their own rules up as they go along? There was talk about the Stretton Airfield becoming a motor sports and advanced driving academy a couple of years back. It never happened though and think the developer either pulled out or it was refused by the council as there was a lot of opposition to it. Shame as it sounded rather good actually. Half of it's in WBC's boundary and the other half in Cheshire CC's boundary so anything that happens probably has to have two approvals (or it was anyway but the boundaries may have changed in the past few years). I don't think any light aircraft take off from there though as dont they usually use Barnton/Rixton etc . was stretton call hms blackcap in world war 2 ? Yes.....and I'm sure there is an old topic somewhere on the forum about it. I'll have a look in a sec. There's some great photo's of what's left on there on the following link. Some are quite recent too. and some more here including the insides of the air raid shelters. Fascinating ! "RNAS Stretton was originally planned as a Royal Air Force night fighter station to protect Liverpool and Manchester from Luftwaffe air raids during World War II. However changes in German tactics meant that the airfield was not required so it was transferred to the Admiralty on completion. Three runways and numerous hangars had been built. HMS Blackcap was commissioned on 1 June 1942 and forty-one Fleet Air Arm Squadrons were based here for varying periods with some aircraft being flown directly to and from aircraft carriers operating in the Irish Sea and other nearby waters. The Airfield was closed on the 4th November 1958. In recent years, Oil Giant Shell, used the Airfield to test engines, and they built a control tower, this is not to be confused with the origional tower, as that is now long gone. A few of the origional building are still standing, but you need to keep your eyes peeled for them, as many are within Appleton Thorn Industrial Estate. The Runway is in remarkably good nick, as are 2 Air Raid Shelters and a Water Resovoir." I took a walk on HMS Blackcap 2 years ago. The runway is good condition and so are the taxiways. It had 3 runways originally but the M56 cut it in half and Appleton Thorn industrial estate was built over the most part of 2 runways. Just like RAF Burtonwood where the M62 cut that in half. HMS Blackcap would have been a big airfield in its day but like most old MOD sites in Warrington they never lasted long after WW2. There is a farm at one end of the runway and when I was there he had a light aircraft parked there so one would assume he used the runway to take off and land. 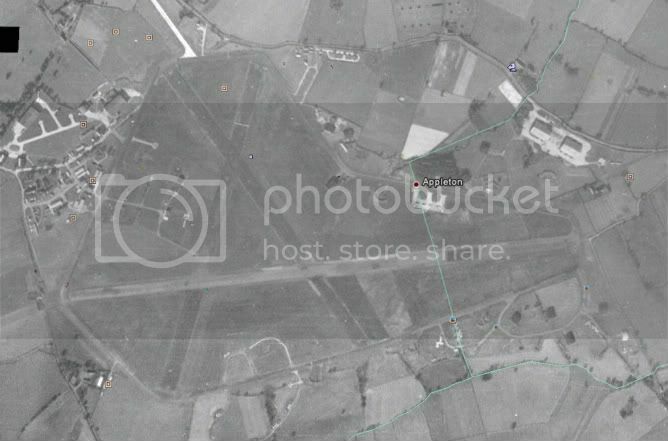 It would be nice if it reverted to its original use as an airfield but I can't see it and who knows what will be there in the future. I've never been ther myself but after seeing the photos on the links I wouldn't mind a wander round with my camera. I did not see a way to get a car on there. There are gates but they are padlocked. Someone still owns the land. Shell maybe? There is still a lot of evidence left behind of there use. Empty fuel cans, signs etc. I'm sure everyone, myself included thought about getting cars or motorbikes on there. You would get some speed down that runway. Ah well worth a thought as I can't get insurance for my lad to drive mine on the public highway so I reconned the airstrip would be ideal to practice 3 point turns and the like. Anyway I digress AS USUAL... sorry. Maybe you are right about the two airfields as that's never occurred to me before but I'd imagine it was more to do with the locations of houses, roads and other buildings that they root the route they did. I don't suppose any of this is really helping Saronie and his/her original question though. "The main runway is privately owned by a local. He rents (or rented as I've not seen it used for a while) to Shell Oils for engine testing. A small section towards the jet extension is occasionally used by said local for his own light aircraft." Dizzy. Go up to the Thorn, Straight across, down Arley Straight to the cross-roads, turn left and that will bring you to a bit of the airfield where you could have your lad practising. Not 100% sure as it is some time since I was down there, but I believe it is not a council road. I was just browsing Google maps when I noticed the runways was still intact and that it appeared to be in reasonable condition, so wondered if it was still in use. I remember when I worked at a local TV shop in my late teend we would drive across the runways as a shortcut from Stretton to Lymm. I notice on one of the recent photographs there is a windsock flying. 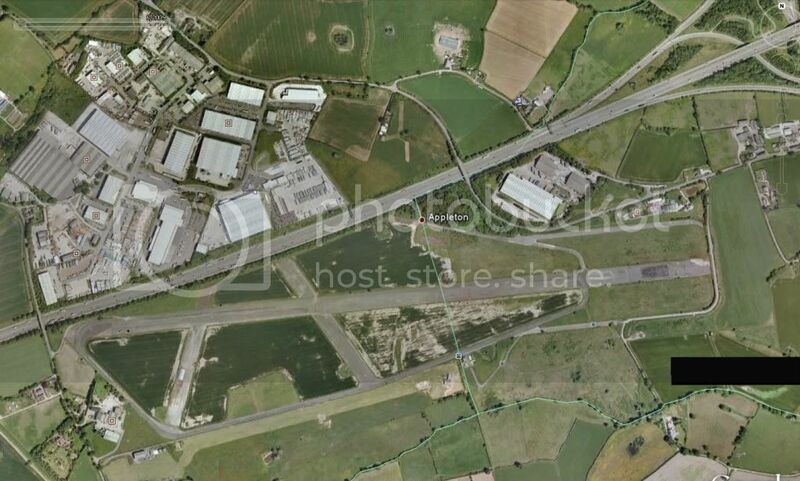 The runway looks longer than the grass strip sy Haydock Park and that too is very close to the motorway. When did the Celtic Sea get named? Works for me on Firefox, I use flightradar24 regularly to track any of our family flying out/back on holiday.